An outlaw (Joel McCrea) hoping to go straight is busted out of prison in order to help with one final job. Meanwhile, a half-breed dancer named Colorado (Virginia Mayo) falls in love with McQueen (McCrea), who is interested in the duplicitous daughter (Dorothy Malone) of a kind settler (Henry Hull) instead. Raoul Walsh’s remake of his gangster flick High Sierra (1941) is cited by many critics and fans as the better of the two, but I can’t say I agree. 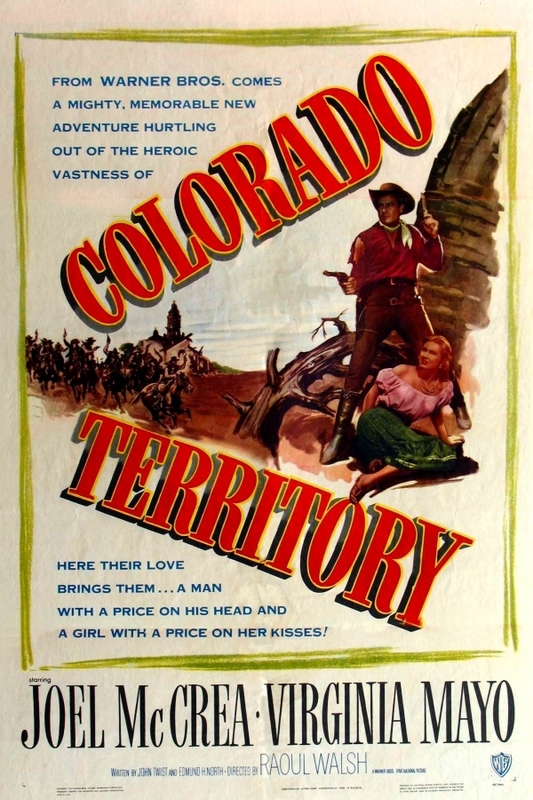 While Colorado Territory is a fine western in many ways, it ultimately doesn’t offer much that’s new or exciting. The love triangle is especially weak, with Malone’s character too underdeveloped, and Colorado coming across as a cliche of every “bad girl trying to make good” we’ve ever seen. The best aspect of the film by far is the beautiful cinematography of New Mexico locales, especially during the final climactic scenes. P.S. TNT produced an insipid colorized version, which you should try to avoid at all costs; instead, wait for this film to show up on TCM in its original b&w glory. No. Although this film apparently has a cult following (and Peary lists it in the back of his book as a Personal Recommendation), I don’t think it’s must-see viewing. ~and certainly a disappointment after just seeing McCrea in the far superior ‘Ramrod’. In agreement that ‘CT’ isn’t a bad movie – it’s certainly competently made for the most part (though it runs out of steam some near the end) – but there was no real need for a remake of ‘High Sierra’.